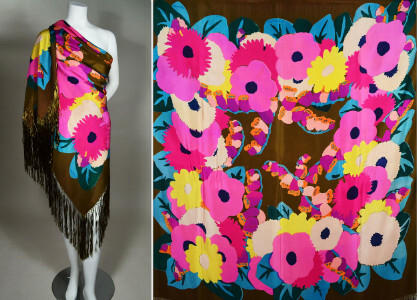 VIBRANT twenties ART DECO floral silk screened shawl... for the refined Gatsbyesque flapper! Olive-gold ground silk with cerise, magenta, fuchsia, teal blue, yellow and orange. Bold large scale ART DECO flat graphic flower shapes. Hand knotted olive-gold silk ribbon fringe. Measures approximately 53" X 55" with 10" fringe. Inspired by the brilliance of Fauvism, this is the ultimate in 1920'S opulence. AMAZING! 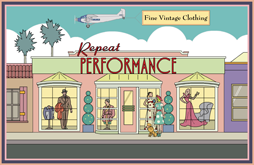 Shows to extremely minor fabric pulls/holes in one corner... seen only under close scrutiny. Superb for fashion or display... a breathtaking accessory!